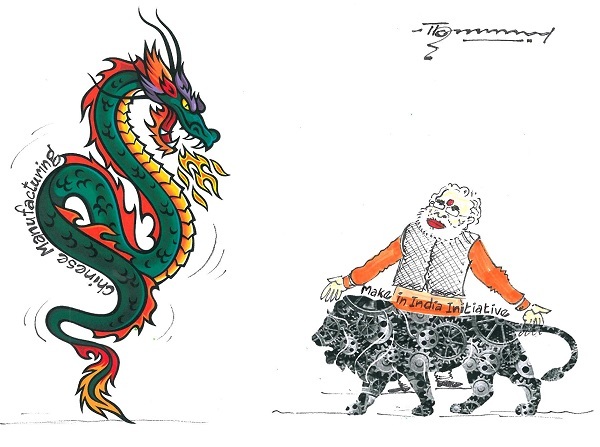 On one side is Chinese dragon, on the other side is Indian lion, One is interested in manufacturing and exporting, one is interested things be made in India. One has hit India in 1962 war. The other has not done so far to hurt China. Both have changed much in the years gone. But still there is tussle between them over boundaries. India has to be careful calling 'Hindi Chini Bhai Bhai' Will SARC help? One is found ready to help Pakistan, other has not shown such help. Narendra Modi must be knowing the past. Association has been made at Brazil. Cub's size will change in sometime, he is going to be big !